Given that curation is the new black*, or at least a popular, effective way to tell stories, the number of tools caluclated to help with gathering and presenting information rises every week. Since I have accounts with any number of them of them, albeit mostly unused, and happened to be using Storify for work today, I thought it might be interesting to run the rule over a few others. For me, Storify offers great flexibility and is very user-friendly – the drag-n-drop approach is fast to pull together and it offers excellent sources. I also like the fact that it has a bookmarklet you can drag to your browser bar – one click and you’re ready to start curating a swathe of information. However, it would be incredibly useful to be able to put date specifications on some sites (particularly Flickr and YouTube) as a lot of the returned media looks exciting but is historic. Also, it can take time for the widget to load. And if you’ve got a lot of content, it’s l-o-n-g – by which I mean it takes up a lot of space on a webpage. Which, from a user point of view, has potential to be annoying – particularly if it’s embedded mid-story. From using CIL for liveblogging I know users on busy blogs complain content revelent to their interests is hard to find. I feel the same issue here – it would be nice to have the ability to put a * (or something a bit more sophisticated) next to, say, official sources or interesting links. I joined Storyful years ago and I think it’s an effective curation tool with lots of functionality (including date relevance) with the added bonus of being very handsome (Storify is, well, a bit functional by comparison). Here’s the one I made. The search sources are the same, Twitter, Flickr, YouTube, Google and rss, with the ability to add links. I also like the Add A Section tool – it distinguishes a new strand of information and has the nice, newsy feel of a sub head. Alas, Storyful curations exist on Storyful; you can’t embed them anywhere. You can tweet and Facebook them but that’s it. The lack of an embed code is for me, as a basic techie only, a shame. 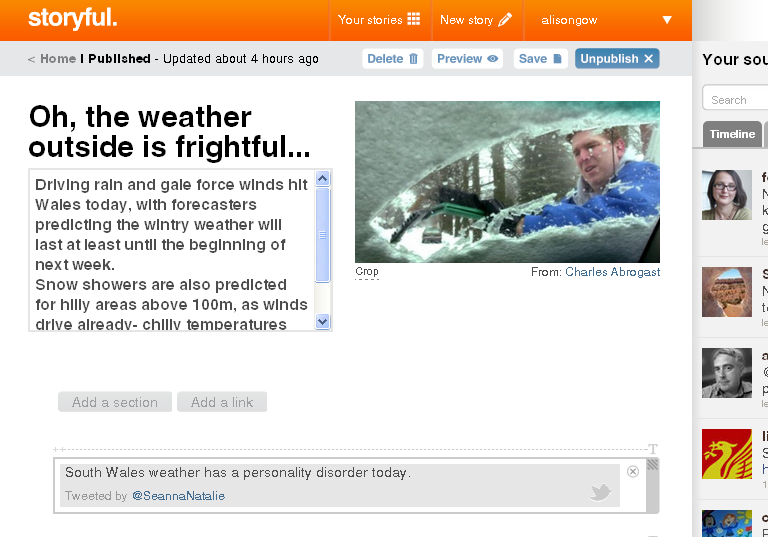 I like Storyful very much but I want to be able to post my creation elsewhere if necessary and that’s just not possible. Themeefy got off on the wrong foot by a) autotweeting that I’d joined without making it clear this would happen, and b) being less intuitive to work out than the others. However, I only discovered this site at the weekend and got round to testing it last night so I may have been a bit frazzled and lacking in concentration. 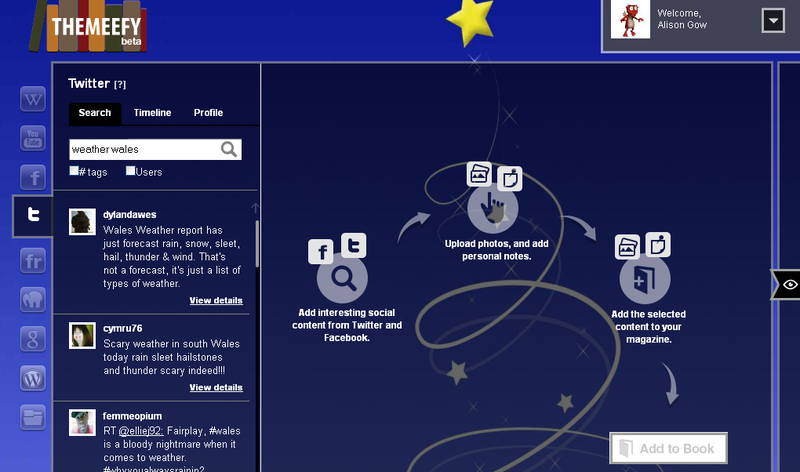 So, the idea is much along the lines of Storify – you get your menu alongside a space to create your ‘magazine’. You can add social media (and it’s got by far the largest number of sites available – the usual suspects plus several others from Wikipedia and WordPress to Bibkosh (associated social media site) plus the ability to upload files and photos, and design a page from scratch with hyperlinks, text, photos and more. I liked it, I have to say. The Themeefy I made is superficial (in my defence I was very time poor) but it worked well – it felt a little like Storybird – and it had the crucial embed ability, plus the usual social media link ups for publicising your work, and a ‘comments on/off’ option. I would like to be able to add more content to each of the pages more, so they had more of a paper.li feel; I couldn’t work out how – or even if – that could be done. Having said that, the ability to create a unique page, with multimedia, was a useful feature. Bundlr: Chrome bookmarklet, bookmark extension, collaboration with others, various social media integration, embeddable. Pearltrees: Blogged about this one before: I like it as a curation tool. Offers multi-collaboration, embeds,and the opportunity to open up sections so your tree has ‘branches’ dealing with specific topics. Scoop.it: Beautiful to look at, frustratingly limiting to use. * Apologies to the Cliche Police; I really don’t have an excuse.